Easter Island was never on my bucket list of places to see. However, I was very excited for this visit learning it was an overnight stop for our Oceania cruise. 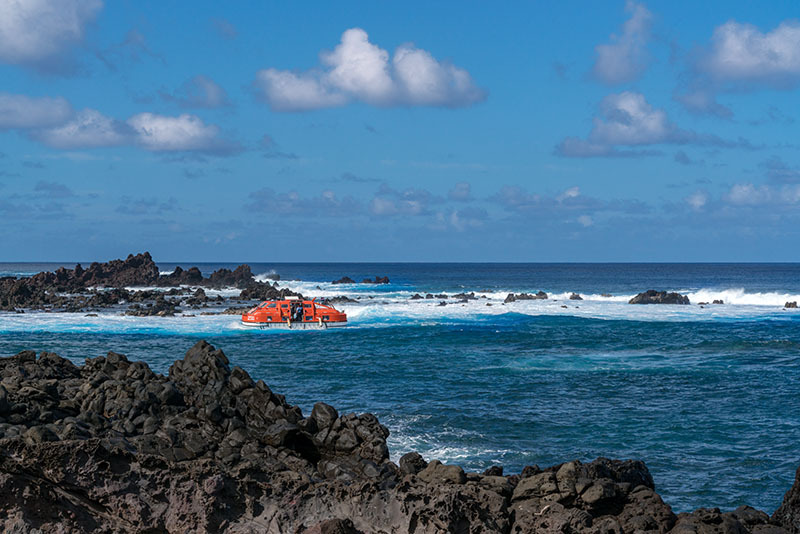 After five days at sea, departing from Lima, Peru, we arrived in Rapa Nui or Easter Island. It was discovered by Europeans on, you guessed it, Easter Sunday, 1722. I was now going to meet their famous stone faced residents, the moai. Easter Island is very small, about fifteen miles long and seven miles wide. So it is not surprising that this volcanic island has no deep water port to handle cruise ships. Cruise ships such as the Oceania Marina are required to anchor offshore. All passengers wishing to go ashore must board lifeboats and be tendered through large waves and past rocky shores into the small dock area. At each port of call the cruise line offers many different tour packages. Aboard modern air-conditioned buses the tourists are whisked off to the designated locales in comfort. But all too often these are conducted by a guide struggling in English who seems to talk 132% of the time. We seldom opt for such tours. However, one big advantage to these tours is you are allowed off the ship first to get on the bus. Not participating in a tour, we had to wait for hours in the ship auditorium before being allowed to be tendered ashore. As is reasonable, the paying customers with a deadline have priority and get off first. But what a chaotic mess the Oceania Cruise ship made of this process. Many hundreds of anxious people are trying to get off the ship, some with tours, others not. When you enter the ship auditorium you are handed a colored ticket, or if on a tour a specified ticket for that tour. When your ticket color is called, you rush for the exits of the auditorium and line up to get aboard a lifeboat to motor ashore. Those passengers on a ship organized outing get called first since they have paid handsomely for the privilege. As Steve Martin famously said in the movie the Jerk, “Oh, it’s a profit deal.” Our ship thought it best to designate a young girl from Bulgaria with a heavy accent to talk on a microphone to the crowd, explain the process and call out the ticket colors. As best I could understand, her name was Octopus. Many cruise passengers have hearing difficulties in the best of times. None of us could differentiate between colors ‘green’ and ‘cream’ being called, so of course both of these groups head to the exits jostling for position, all refusing to relinquish their coveted spot in line. Those with walking canes had an advantage in the ensuing battle. Over and over again, our ship acted like they had never handled a large crowd before. Adding to the disembarking process were the exceedingly rough seas. Boarding the lifeboat meant timing the three foot swells just right. That was quite entertaining to watch in itself. Finally ashore, we are greeted by many eager and aggressive taxi drivers and tour directors. With little planning and not knowing what to expect, as well as being motivated by the extreme heat, we accepted the very first offer from a nice lady offering to take us on a tour around the island. I handed to her a list of four main moai sites I wished to photograph. Off we went to tour the statues. When a ship comes to port, anyone who can seems to come to the harbor to try to cash in on the tourist frenzy. We could not have been happier with our cheerful local guide. 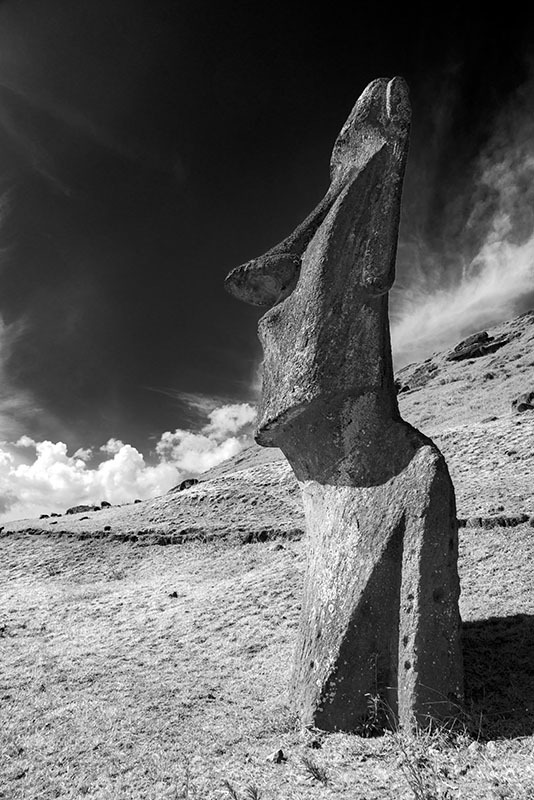 The standing moai of Easter Island, at Ahu Tongariki. Photography note: I took the above photo with dark filters to make it possible to take a three-minute exposure in full sun. The goal was to blur the clouds. Apparently I had used my lens as a shovel in a sandbox somewhere in Peru and the glass was full of dust. At f22 these spots appeared as circles above, resembling bokeh, in photo language. However, in the end, I think it had an interesting effect. So if you wish to replicate this effect, toss much dust on your expensive lens. 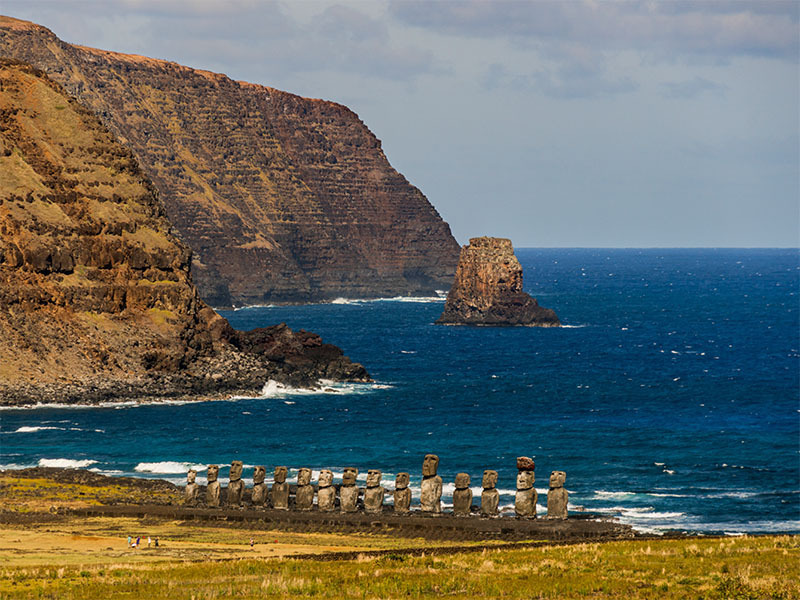 Easter Island is part of Chile and is one of the most remote islands in the world. When first visited in 1722, the island was already mostly deforested. No trees more than ten feet tall existed. The population was also in decline, numbering about 3,000 from a high of 15,000 residents. Some theories say the many palm trees were chopped down to aid in the rolling of the 75 ton statues. Others say the rats brought with the original settlers ate the palm seeds and contributed to the demise of the trees. How would the population not become increasingly concerned with the dwindling supply of palm trees? “OK, boys, today we chopped down the last palm tree, now get to work.” It would seem more logical that the rat played some role in the deforestation. European visitors in 1770 noted that the statues were all upright. However, in 1774 James Cook noted the statues were often tipped over, facing down. Wars between the competing island tribes resulted in toppling the statues which were thought to offer some protections to the tribe who erected them. South American slave traders, smallpox and tuberculosis rapidly brought about the final demise of the island. 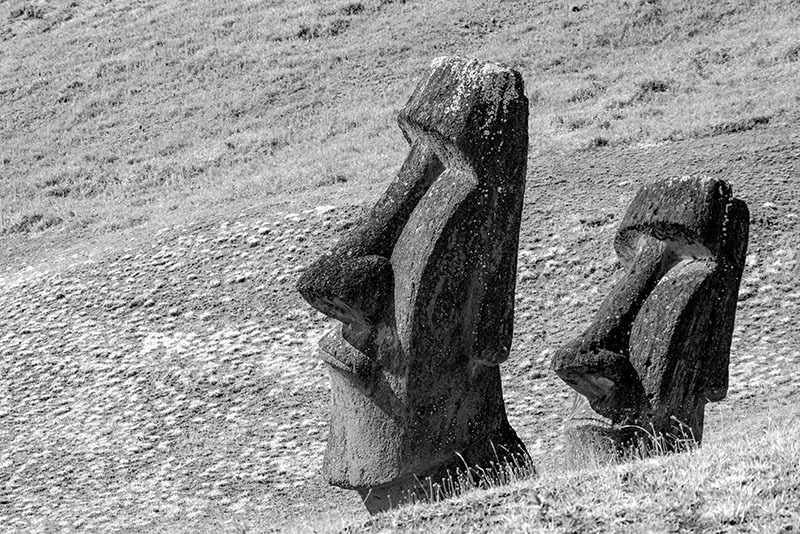 Chile annexed Easter Island in 1888. 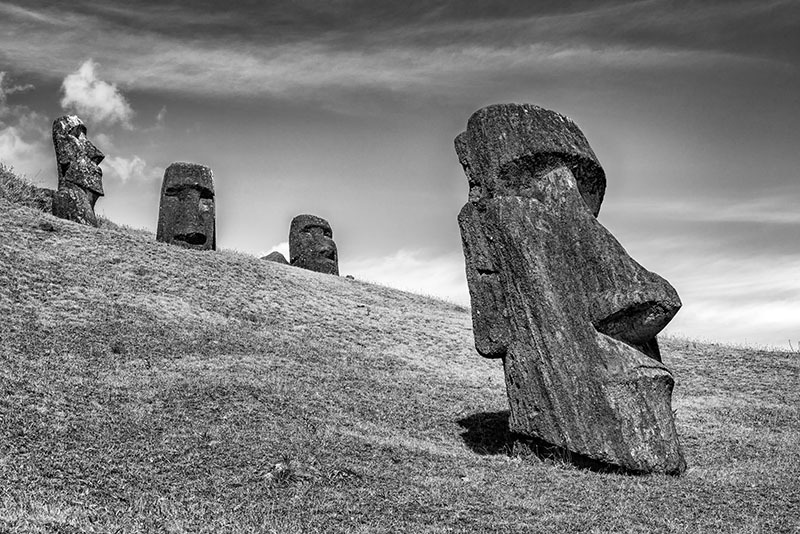 For a couple hundred years, the moai remained in their toppled state. Many remained face down in the dirt. 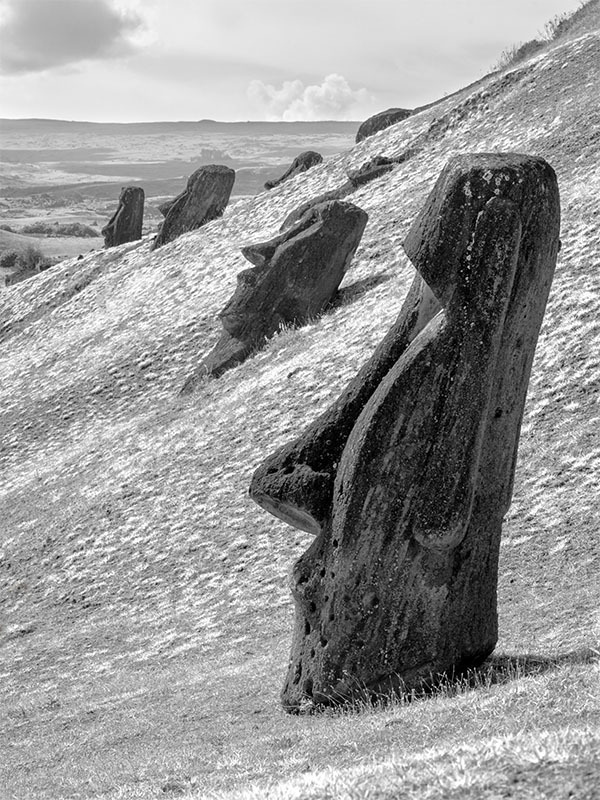 Then in 1960, a Chilean earthquake thousands of miles away, magnitude 9.5, brought further havoc to Easter Island. The stone statues were struck by a tsunami, rolling and tumbling them over 100 yards inland. 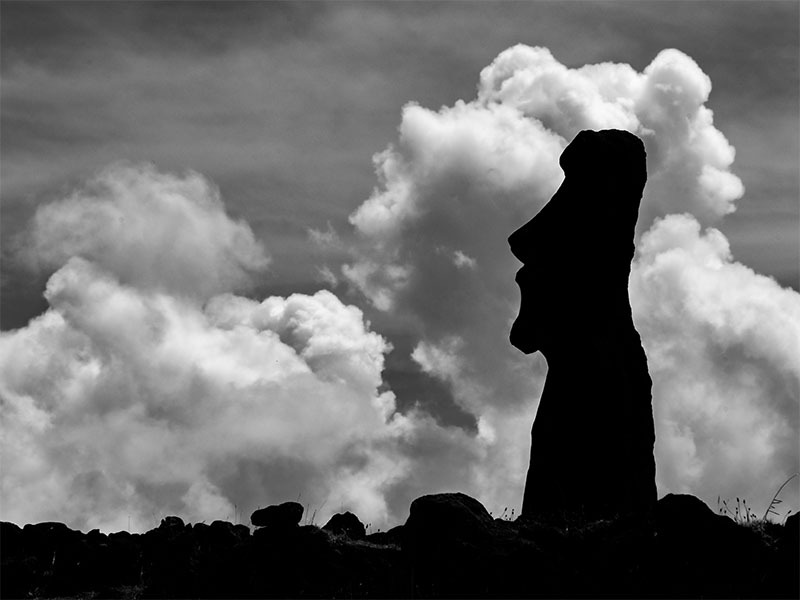 Thirty-five years later, after much study and work from several nations, the largest group of moai was repositioned to the site seen in the photos of the fifteen moai. 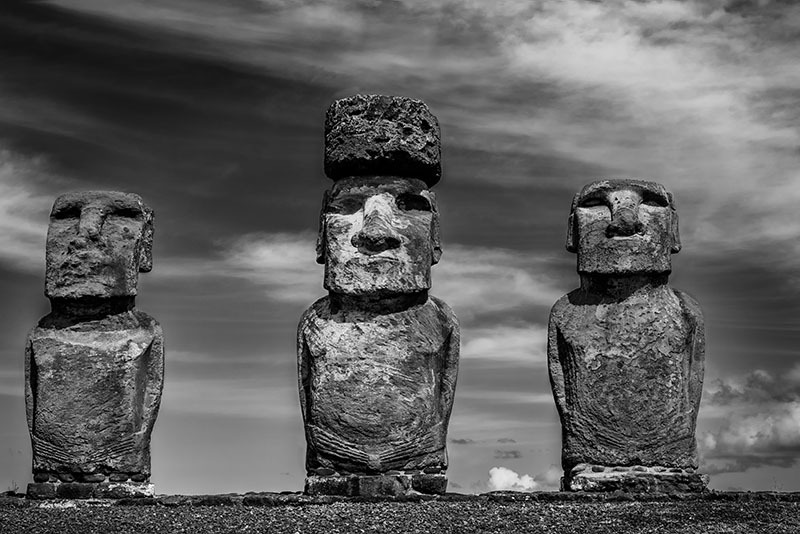 To provide an overview of the Ahu Tongariki moai, above is a view from the nearby mountainside looking down at the fifteen statues. This nearby mountainside is the quarry where all of the stones were dug. The work of digging, carving and moving of these huge statues seems to have stopped suddenly. Some are only partially carved and some moved only a short way down the mountainside. I got a new hat today and I’m thinking of rooting for Green Bay this Sunday. No, I don’t know his name. He just said he was a Storm Trooper. 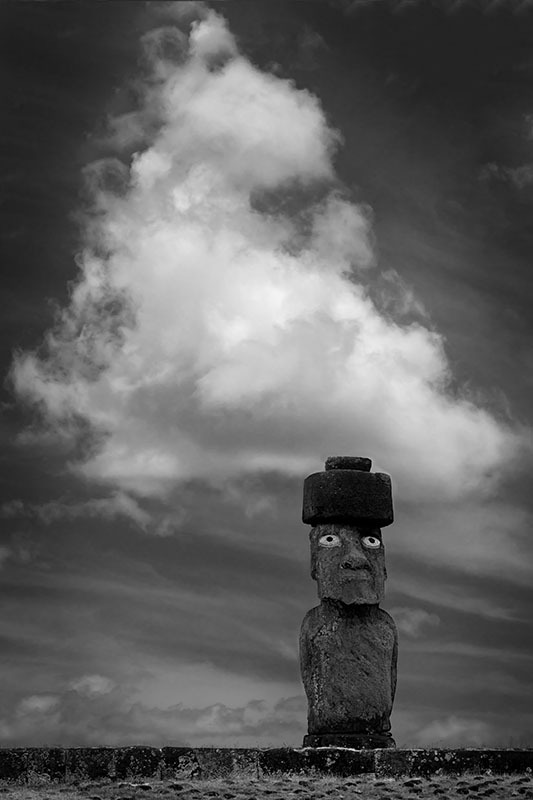 This lone moai serves as a greeter at the entrance at Ahu Tongariki. Hey, look at me, I got mouse ears. In 1978 during the protracted renovations after the 1960 tsunami, it was determined that the red bits of coral found at the base of the statues were actually eyes. This one statue at Ahu Tongariki has had his eyes repaired so we may envision how many of the moai originally appeared. This is a particularly sacred site for the inhabitants of Easter Island. 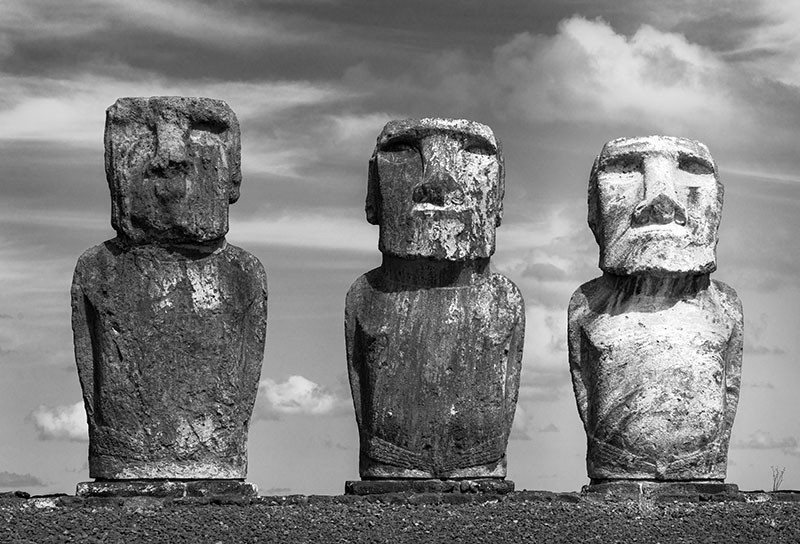 All other moai are facing inland with their backs to the ocean. Here, they look out at a point of sunset during the Spring Equinox. 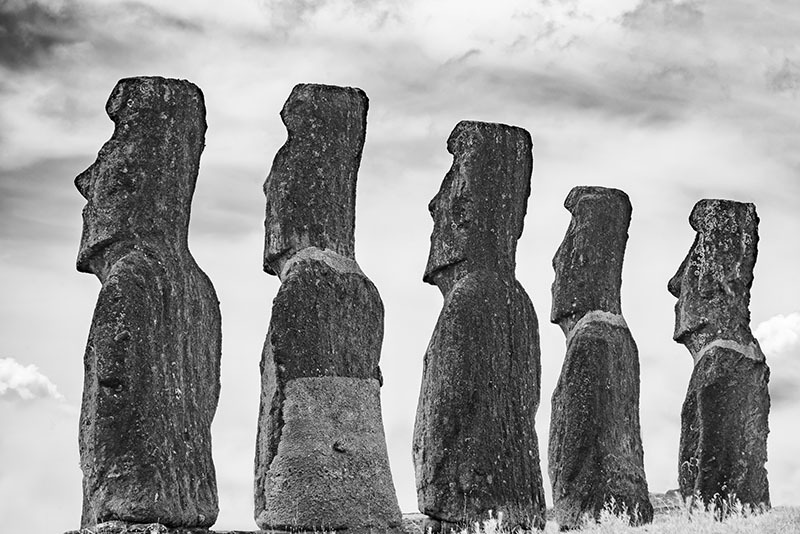 Also unusual at this site is all the maoi are of the same height and appearance. Age has deteriorated their faces today. 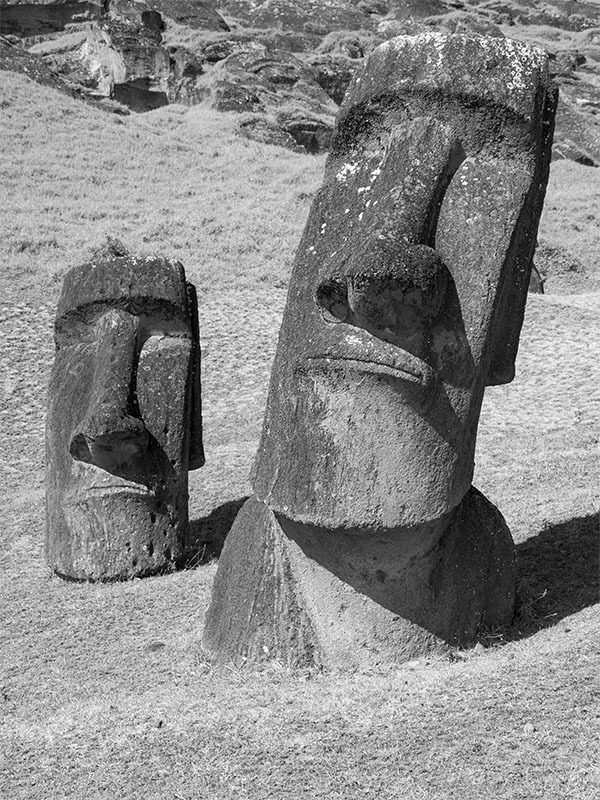 So the bartender says to the moai, why the long faces? Next week I hope to show you the rest of this beautiful Island. Our thoughtful guide pulled over at this section of beach saying it was one of the most beautiful beach spots on the island. I have to agree. Shame someone hasn’t carve away to earth to show the bodies of the heads, like the Japanese warrior statues. According to archaeologists, they discovered the bodies in 1914, or thereabouts. Wonder why none display teeth? Leprosy back in the day? Great adventure, beats Stonehenge in my humble opinion. Yes, I’ll agree with that. There are many varied maoi sites, I visited but a few. Good restaurants and friendly live residents. Thanks for the equipment tips, Harold. 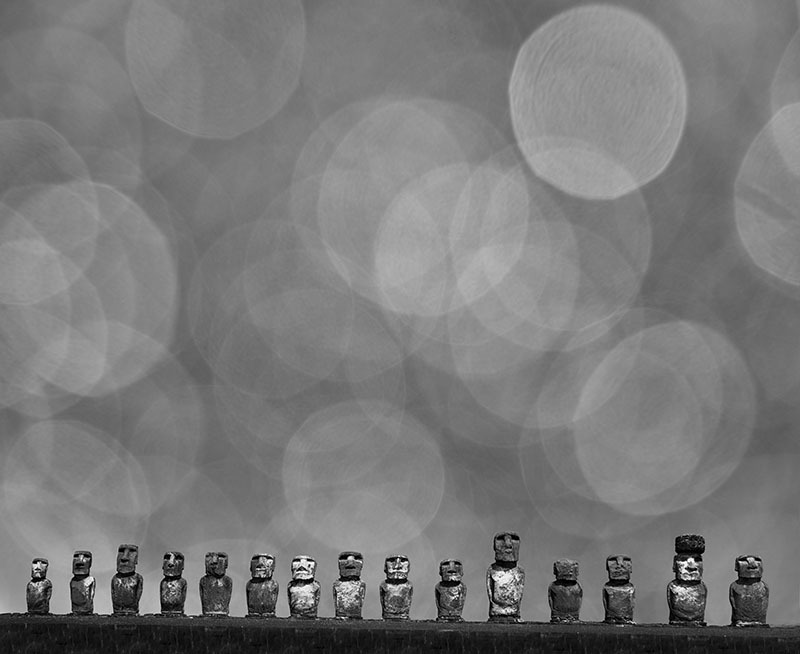 I’m thinking I’d like more consist bokeh results, though. Instead of applying dust on the front element of lens, I’m thinking that disassembling the lens, expose all internal elements to the open air, and then atomize some hair spray in the room in which the disassembled lens resides. Such a process should result in more consistent results, once the hair spray dries. A side benefit for zooms is that if you like the focal length at the time of re-assembly, the lens becomes a fixed focal length lens, you the user doesn’t have to make any further adjustments. Spoken like the true engineer you are. Thank you so much for including all of us “out here” in your travels. I marvel at your patience. After reading your blog, I know my husband and I could never handle world travel! I’ll just enjoy it through your wonderful site. It is ‘getting ‘ to us as well, which is why we are coming back to Meridian and looking forward to it. You made me laugh out loud with this one!! The disembarking event was hilarious! This is another one of my life long bucket locales! 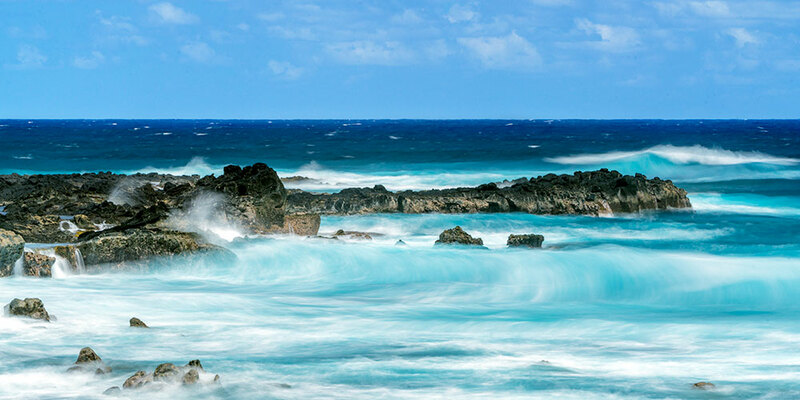 The black rocks and brilliant blue sea pics were exquisite! Thanks for the history too. … and your comments and being a faithful follower makes me happy as well. Yes, and they were quite raucous bunch at night. These are terrific! I had no idea maoi had such a sense of humor. You make me wish I was on the boat with you. Easter Island has been on may bucket list for a long time. Good luck in planning your bucket list trips. Thank you for the information on this island. Now I don’t have to see it. Your awesome. Glad you have the blog!!! Glad you can follow along. Harold — Your description of the disembarkation process is hilarious and 100% accurate. We generally book a ship sponsored tour and have experienced the “barely English speaking” crew members directing the disembarkation and the loquacious tour guides exactly as you describe. 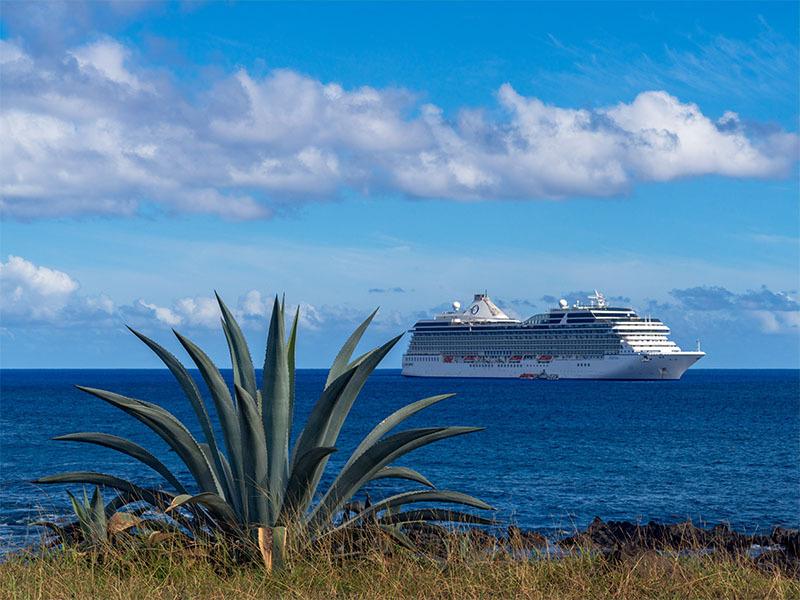 The only advantage to the expensive ship sponsored tours (along with many disadvantages) is that the ship will not leave you behind if you are late returning to the ship. On two occasions, one in Mexico and one on the Greek island of Rhodes, Ann & I have seen some of our fellow passengers standing on the dock as the ship sails away because they returned too late. They had to find their own transportation to the next port of call to reboard the ship! Easter Island is one of the places I have longed to visit. But, alas, I think I have missed it. Anyway, I am enjoying it through your blog and I look forward to seeing the next iteration of your adventure there. Not being left behind is indeed a huge consideration. Mis-reading Italian Sunday train schedules in Italy is the closest I’ve come to missing the boat. Of course Gayle made the wise decision to not accompany me on that particular self directed tour. We HAVE enjoyed numerous ship organized tours and hope to do so again on our next trip. Loving the photos Harold. If I wasn’t so lazy, I would read too. Maybe not so lazy as busy with your own very hectic pace. I know I could not keep up. Thank you for taking the time to read, oops look. Love reading about your adventures. My uneducated eye has enjoyed the extra level of background perfectly placed by the dust. The disembarkment process sounds like herding wet cats when you are the one yielding the hose. Thank you for taking us on your journey. It certainly is difficult to get to Easter Island. Our boarding process in Lima was the worst we ever experienced. Oceania was carful to keep the luggage in the shade and the elderly passengers in the sun, without water or shade for hours. Hard for me to believe I’ve been to a destination you two have not yet traveled. Easter Island is one of our favorite places we’ve been to. Loved reading your experiences on it and the process of getting there! Our experience was similar, however, we shelled out the big bucks and took the tour. Our guide was worthless. We thought he was either hungover or bored to death. Maybe both. But the moai were breathtaking and awe inspiring and we were very glad we got to see them! Love your photos! You really captured the mood! Your photos and writings are great as always. Easter island is somewhere i may never visit, but always wanted to. Can’t wait to talk at length with you and see more photos. I’m happy you took the time to read my blog and look at my photos. I’ll have more on Easter Island next week. It is indeed a L-O-N-G way to go to photograph the moai. Harold, GREAT STUFF!!! Enjoyed the comments, a man after my own mind – one of us is in trouble!!! I loved your description of the boarding process. Hilarious! I’ve been on a few cruises and can relate. Just wait… next week I’ll have worse Oceania Cruise stories. I was trying to see something in your shots that would sense of how big these bad boys are. How tall is the average Moai? They are 13-15 feet tall and over 14 tons each. You are right, I’ve not provided much of a clue as to their size.